If you’re looking for adventure, as well as an outrageously amazing culture, Twin Rocks can help you find that, too. At Twin Rocks, we’re locals, and we have plenty of tips for you to enjoy Bluff, our home. If you’re into it, our home offers any kind of backcountry adventure you can image. Take off from Bluff to the west and discover the incomparable Cedar Mesa. Driving the exciting Mokey Dugway on Highway 261 or coming in from the north on Scenic Byway Highway 95, leads to some of the most beautiful canyons anywhere! The trailheads for these canyons are accessed by dirt roads, and some may require four-wheel-drive. Exploring the canyons can be as short as a day hike or, for the more adventurous, provides opportunities of up to a week or more of hiking through spectacular scenery while investigating Ancestral Puebloan ruins from a culture of a thousand years ago. Some of the canyons offer arches and bridges carved by millions of years of erosion and slickrock trails for smooth walking. There are many dramatically different canyons offering opportunities for return visits to see them all. And, there is the glorious San Juan River. It is one of the creators of the Grand Canyon. A word of caution: The archaeological sites are VERY FRAGILE. Climbing and pulling on the walls is forbidden as is taking ANYTHING from the site including artifacts and other remains. Please take the time to learn about the Anasazi and the proper protocol for visiting these sites. Surrounding Bluff are still more canyons and mesa-tops to explore. These areas can be easy day hikes from roads just outside of town and offer more rock art panels, ruins and just great views of the amazing desert landscape. Explore on bicycles or motorcycles. 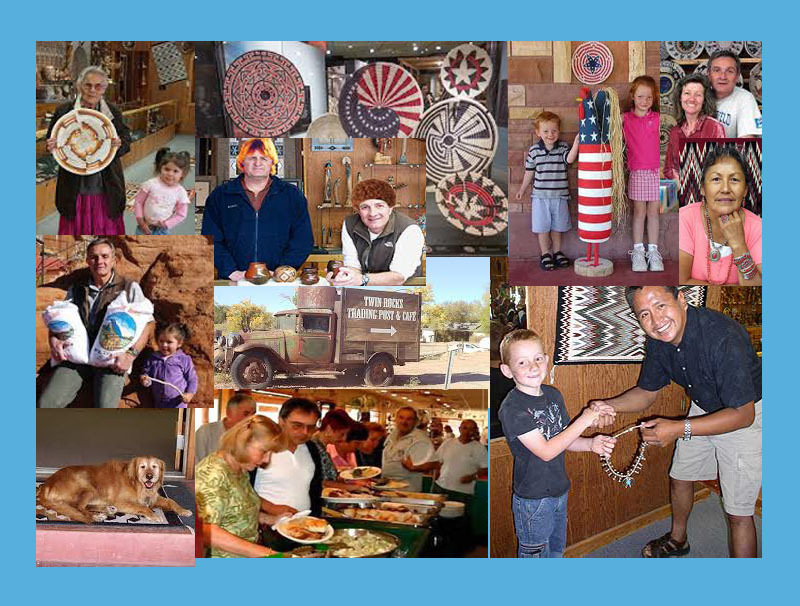 Drive throughout the Four Corners region and visit the sites that bring the world to Bluff. Monument Valley, Valley of the Gods, Natural Bridges, Mesa Verde, Arches, Canyonlands and Hovenweep are just a few of the National Parks, Monuments, Navajo Tribal Parks and State Parks that attract visitors. Experience serenity, beauty and natural wonder. The photographer, budding archaeologist or sightseer will enjoy the landscape of the entire region. One of Bluff’s most popular spots is the BLM Sand Island Camping Area. It is the put-in for the famous San Juan River trips in the region. Even if not taking off on a river trip, be sure to stop and see some of the most telling examples of rock art. From ancient times, many cultures have left their mark and told their stories on the painted walls along the San Juan corridor. Then spend one day, or many, traveling the river known for the steepest gradient in North America! A fast moving river without technical whitewater, it is a challenging trip with opportunities to view layers of geological formations and to visit fascinating rock art and ruins on short hikes along the way. Whether traveling all 84 miles to Clay Hills take-out for a multi-day trip or just doing the 26 miles to Mexican hat – in one day or a few – the San Juan features a trip that is enjoyable for the entire family. From senior citizens to kids with water-fight buckets, everyone enjoys trips through the scenic canyons of the San Juan. Mountain bike enthusiasts will find a pleasant diversion from slickrock trails here in Bluff. There are many dirt roads taking off just outside of town that lead to wonderful views, interesting archaeology and just great rides. Only 25 miles north of Bluff are the Abajo Mountains offering a cool break for the summer visitor and even backcountry skiing in the winter. The 10,000 feet of elevation there showcases lakes for fishing and easy access by paved and unpaved roads for spectacular vistas and shady picnics. Come visit Twin Rocks, and then explore our home! After you’ve stopped by Twin Rocks Café, and you’ve perused the beauty in Twin Rocks Trading Post, take a walk up the winding hill just behind us. It’s there you’ll see the Great Kiva in Bluff, UT. By the late 1000s, a powerful new cultural sensibility swept across the Mesa Verde region, which includes the canyon-rich landscapes of southeastern Utah. Deriving from New Mexico, this “Chacoan Phenomenon” featured bold architectural elements: great houses, great kivas, and roads. Bluff Valley’s social center was relocated to the north side of the river onto a hilltop that overlooks the entire valley. This new community center, the Bluff Great House site, included a multi-story masonry great house and an enormous subterranean great kiva. Archaeological research suggests that the site remained in use for about 200 years. 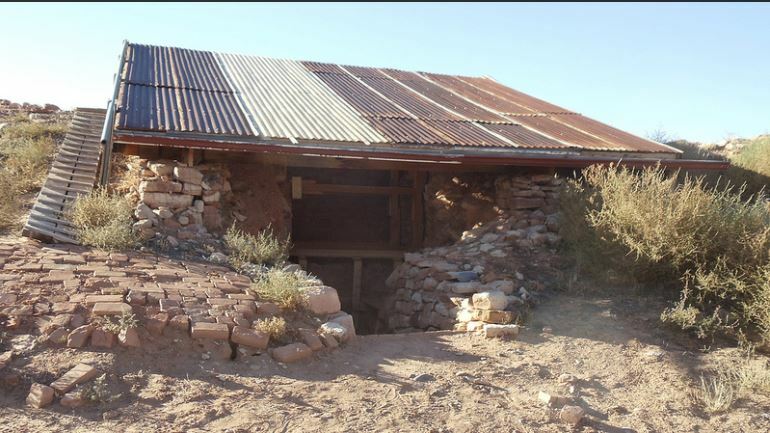 The site itself was the southern terminus of an extensive network of great houses and prehistoric roads that stretched from the San Juan River to the foot of the Abajo Mountains in the north. By the mid-1,200s, this great alliance had fallen apart, and the Puebloan people moved south to inhabit the landscapes of the Rio Grande, the Zuni Mountains, and the Hopi Mesas. All of this plus good food and terrific art. What more could you want?